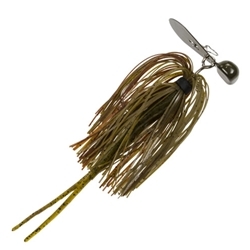 The Strike King Tour Grade Rage Blade is the better mousetrap for bladed swim jigs. It's unique design iincreases hook ups and decreases snag ups compared to other designs. The Rage Blade has a custom Gamakatsu hook and the incredible action and vibration make the Perfect Skirt and trailer come alive! Features Twin Tail Trailer, Strike King Perfect Skirt, Custom Gamakatsu hook, and a unique Head & Blade Design.